The larga is the spotted seal (Phoca largha) that lives in the North Pacific Ocean along the coasts of South Korea to Chukotka in Russia, and from Alaska to California in the United States. These seals choose coastal rocks in shallow bays for their rookeries. In winter time, larga seals spend a lot of time on ice near ice holes, or on floating ice floes along the coast. These seals feed on fishes, octopuses and shellfishes. Seals pups are born in February to March when local sea bays are still covered by ice. Seal pups have white fur; hence, local people in Russia call them “beliek,” which means “white puppy.” After giving birth, the mother stays and feeds her pup milk for only seven to ten days. Afterwards, she leaves the pup in order to go hunting. Fledgling young pups remain alone for a long time. During this period, they do not yet know how to hunt, so they can starve, lose weight and some may even die. Human presence and shipping activities also have an effect on the survival of the seal pups. Sometimes inexperienced pups appear in the waters of seaports. If they get trapped in black oil slicks, they will get serious poisoning. In these situations, it is a matter of life and death for the seal pup, as in 99 percent of cases, they will die. This is natural selection. In nature, not all will survive. Then again, people can step in to help save the babies! The first time I saw a larga seal was on the coast of the nearby marine reserve, 400km to the north of the city of Vladivostok (in the Far East region of Russia), where I live. I wanted to see these elegant animals underwater, to dive with them and to take photographs of them. Around Vladivostok, there are several rookeries of seals. In winter time, when all the local bays are covered with ice, I would even see seals in the area of the city. I found my first wounded seal puppy on Russky Island. As I remember it now, his front fin was injured, and he was infected with worms and parasites. I felt very sorry for him. I wanted the pup to survive, so I tried to help the baby seal as much as I could. I learned that in Vladivostok, there is a rehabilitation center that specializes in the care and treatment of injured seals. So, I got a car and a boat, and I brought the wounded seal pup to the seal rescue center. At the time of his treatment, the pup was given the name Russik. He recovered, and in early summer, he was released back into the sea. The story appeared in the local press. In the following years, I inspected beaches near Vladivostok and on Russky Island in hope of finding and helping small wounded pups. On 30 March 2015, I found my next baby seal! The little cub was clean, beautiful, and at first glance, did not look like a sick or injured animal. But I already knew that if a baby seal lets a person near it, then something is wrong. It was a young female pup. Again, I felt had to save the pup and take her to the rehabilitation center. The cub was given the name Eugenie. After this experience, I realized that I should become a volunteer saving seal pups. In my volunteer activity, I joined forces with Lora Bolivian, the founder of the rehabilitation center, "Seal." This rehabilitation center specializes in the treatment and feeding of larga seal pups and striped seal (or ribbon seal, Histriophoca fasciata) pups, and their adaptation back into the wild. Lora, who is a writer, journalist and artist, is the director and founder of the first Russian rehabilitation center for seals. She is a woman who has devoted her life to saving seals. I communicated a lot with Lora and came to visit my rescued baby seal quite often. To help more larga seal cubs, we decided to share our activities with other divers. We needed more helpers, caring people who would be happy to save sick or injured seal pups. I began to invite friends, divers who wanted to help us release rescued cubs back into the sea. Today, it has become our good diving tradition. Many caring people join us for these rescue and release activities. Every year, we manage to help more and more pups. The larga seal is one of the emblems of our seaside diving community. Hundreds of divers meet up with these fun animals underwater. 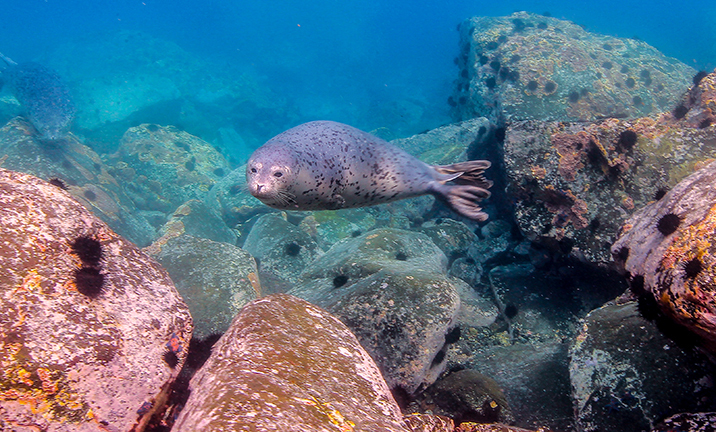 Sometimes the seals are not afraid of the divers and let them come close. They can bite your fins and even give you a chance to touch them underwater. I love to dive with seals; this is one of the main pleasures in my diving life. For any pleasure, you need to pay something, and the saving of seal pups is such a small fee for the huge enjoyment I get from interacting with them. In nature, it is not certain whether these weak puppies would die or survive. But for us volunteers, with Lora and our diving friends, this is not left to chance. Every animal—even if nature has decided that it must die—has the right to a chance for survival. And here, in Vladivostok, we are doing what we can to save every one of them. I remember every seal puppy that I found and brought to the rehabilitation center: Rusik, with a broken fin; Gosha, with torn claws; the baby girl seal Eugenia, with inflammation throughout her whole body; two lost cubs of striped seal; ribbon seals, Alexandra and Alexandra Vladimirovna, who were found soiled from head to toe in their own feces; the goner Barbara—8kg of bones and fuel oil; the puppy Flint, with pneumonia; Katta, who was beaten with stones (she did not survive); Ulysses the puppy; quiet Valeria; Rambo, who was not willing to give up; stinky Alexandra Alexandrovna; stout Alex; narcissus Jack Sparrow; aggressive Vovan; Irina, the hero puppy; and the baby seal without a name who did not survive. Some of the wounded and sick seal babies we took from ice floes, one was driven by car over 1,000km to the rehab center, and one was rescued by someone hiking on coastal cliffs. We are happy that most of our pups have been saved and are alive and well. Anyone interested in participating in the rescue of baby seals who wants to join a diverse group of volunteers, please contact to Evgeny Polukhin and Laura Beloivan (Tel +7 924 241 0788 or email: evzoni@mail_ru @more_than_diving @sea_frogs_diving).